THE ONLY WAUNAKEE IN THE WORLD! 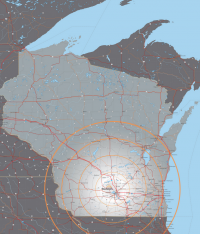 Waunakee's convenient location 13 miles outside of Madison and 85 miles outside of Milwaukee places Waunakee in close proximity to major markets. Futhermore, Waunakee's short distance from Chicago, Minneapolis, and the Quad Cities allows the Village to expand beyond local markets. On behalf of Village President Zellner and myself, Todd Schmidt, thank you for attending the listening session. We had a good back-n-forth conversation that covered a wide variety of TIF logistical and philosophical concepts. It was great to have such an engaged audience of interested citizens. Attached is a copy of the power point slides in PDF format for your reference. Also, as a reminder, the Village has updated it's website to include the latest and greatest TIF information regarding our TIF history and policies. Pertinent documents are linked and available for download. You can check it out here: http://www.vil.waunakee.wi.us/443/Tax-Incremental-Financing-TIF-Districts. Invite Directors, Joe Knilans or Nancy Mistele to your business or industry trade group, Chamber of Commerce or economic development association. Contact information in Brochure below. Waunakee enjoys a quality of life that is a major reason for our growing population! With a higher than average educated work force and close proximity to Madison, Waunakee should be your top choice when considering expansion or relocation. The Waunakee Community School District has 8% more high school graduates than the state average and a young demographic that contributes to the community. There are also top notch private educational options within a close radius. A number of leading employers in our area take advantage of the young, educated population increasing our population and making the Village a great place to live, work and do business. Locate in Wisconsin direct link for available buildings, sites, and stats in the Waunakee Area. Wisconsin is among the TOP 15 states in industrial production. Wisconsin ranks 3rd nationally in percentage of toal manufacturing jobs (Bureau of Labor Statistics). The WEDC is composed of nine individuals including the village president, two village trustees, one representative from the Waunakee Area Chamber of Commerce, one representative from the Waunakee Community School District, and four citizen members appointed by the village president with approval from the Village Board. Meetings are held at 6:00 pm the second Monday of each month. For an official copy of the minutes, submit a records request to the village clerk. Thrive is the economic development partnership for the eight-county Madison Region with a vision to create a dynamic environment where people and business prosper. Collaborating across communities to share best practices and promote the regions of Columbia, Dane, Dodge, Green, Iowa, Jefferson, Rock, and Sauk Counties...Thrive creates values with initiatives that focus on long-term, sustained results aimed at building the region's competitive advantage while preserving and enhancing quality of life. In April 2012, Thrive launched Advance Now: Madison Region's Strategy for Economic Growth, a comprehensive economic development strategy that will serve as a consensus blueprint for the Madison Region's collective economic development efforts over a five year period. Thrive will partner with public and private-sector entities from across the region to implement Advance Now during the years 2013-2017. Their mission is to connect the richness of UW Faculty and staff talent, innovative spirit and entrepreneurial energy with Wisconsin businesses in order to foster job growth and to build better communities. Accelerate capital investment potential for UW-generated innovations and new business start-ups.